Ready to go? 3,2,1....click here to reserve a spot and fill out the waiver online. It's always best that you do this in advance, but if you want to do it at Beacon, please be sure to arrive at least 15 minutes early. You will be prompted to pay the drop-in fee online. If you want one of the special rates or a shirt, we will take care of the difference when you arrive. Call 207-619-2322 or Contact Us with questions. 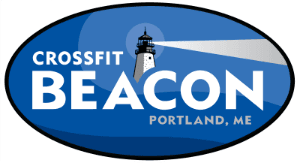 People with or without experience in CrossFit are welcome to attend the "BeaconFit Three Quarter Throw down" classes, a 45-minute high intensity workout that meets Mondays and Wednesdays at 5:00 PM.